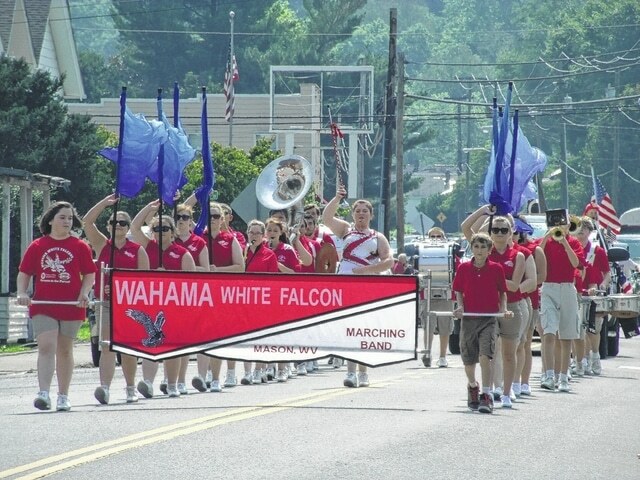 The Wahama White Falcon Marching Band played a patriotic tune for the crowds. BEND AREA — The Bend Area celebrated Independence Day and the local veterans with a day of festivities. The events kicked off with a parade in New Haven. Roberta Hysell, town recorder, said the festivities are to celebrate the veterans and independence, but seeing the smiling faces enjoying the parade is another reason the parade is important to her. Carl Gibbs, 89, served in the Marine Corps during World War II and fought in three battles in the Pacific. While overseas, he was wounded and earned a Purple Heart. At the end of the war, Gibbs was part of the occupation of the atomic bomb area in Nagasaki, Japan. Gibbs said he enjoyed the parade and is thankful for his freedom to come out and watch the festivities. Gibbs said he remembers his time in the service and said, for him, remembering there has not been another war like WWII is another reason to celebrate freedom. After the ceremony, the Bend Area community came out to Mason’s Fourth of July Parade, which ended at the Stewart-Johnson VFW/Lottie Jenks Memorial Park, where the town and the Stewart-Johnson VFW Post 9926 had set up bounce houses, moon jumps, firetruck tours, food and games for residents. Donna Dennis, the mayor of Mason, said she was glad the town was able to spend part of the holiday together. Emily Henry, Mason council member over parks and recreation, said a lot of planning went into the events. Henry also said she is grateful for the help of volunteers and donations from community members and area businesses. The festivities ended in the evening with residents looking across the river to the Middleport fireworks show. This year, the Town of Mason contributed $1,500 to the fireworks display.